This is our new Bronto skylift F32RL. Bodywork by Angloco of Yorkshire. Mounted on a 17 ton Volvo chassis. Thanks. Most of our fleet have 999 number plates. We have different licensing laws on the Island and our plates don't have to meet the same criteria as the DVLA in England. Added by Justin McMullin / Red Watch Douglas Station on 19 April 2006. Added by Marcel Sloover on 19 April 2006. Can you / anyone introduce us some company that are using this Bronto structure and make comple vehicle. And also some other company that make similar product of Bronto? Added by Jamzar on 05 August 2006. Jamzar, if i understand your question correctly: Builders are plenty; Angloco, Rosenbauer, E-One, Saurus... And pretty much any local builder. Another company similar to bronto is vema (vema.fi) - smaller but has sold worldwide as well. Added by Bum291 on 07 June 2007. 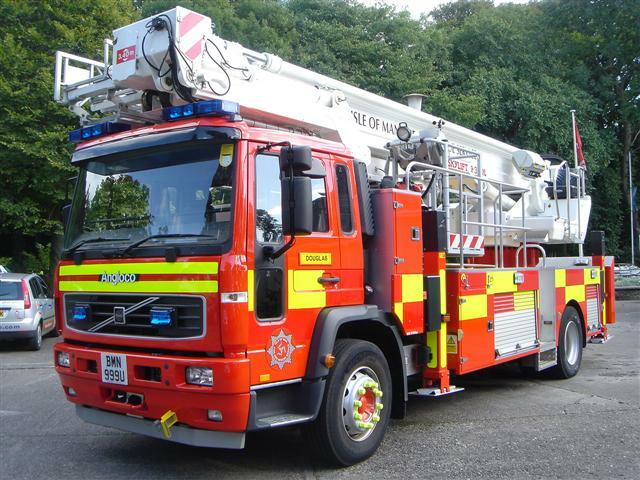 I have seen this appliance before at the IOM FRS website. Anywhere the livery&the battenburg stripe are neatly applied. This make this truck looks nice. Added by Bomba Boy on 18 June 2007.